Includes: 4-Pack of Mouse-Away Solids, an 8 ounce bottle of Mouse-Away Spray, a 2 ounce bottle of Mouse-Away Concentrate, 2 Mice Cubes and complete instructions for use of the Kit. One kit will be all you need for most apartments. Two to four kits may be needed for homes (depending on size, # of rooms and # of levels). 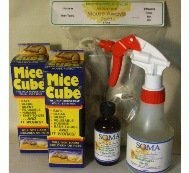 Use Mice Cubes to catch and release intruders, and then place Mouse-Away Solids in problem areas. Use Mouse-Away Spray for general area and around perimeter. Mouse-Away Concentrate can be used to "recharge" the solids and used directly in problem areas (NOT on furniture, plastics, painted surfaces, wood floors, etc.). To learn more about how to use Mouse Away, click on How to Get Rid of Mice or call us to talk about your specific situation (1-800-897-8330). Review: I have a camper parked in a secluded area miles from anywhere. The mice moved in soon after. it has taken some time, but after using Mouse Away every 2 weeks, the mice seem to be gone. Review: I'd have to say this is probably the most effective product I've come across. We initially bought the kit to combat field mice. Between Mouse-Away and my indoor cats, the mouse population eventually dwindled. But the real bonus was in discovering that it also worked great for palmetto bugs and pantry bugs. I use it exclusively now. I highly recommend giving it a try.